Yes it definitely is a Chocolate Blog Week. Someone recently tweeted a comment about Paleo bloggers forever posting treats, pimping cookies and brownies! Are we still Paleo? We have supposedly forsaken sugar and all sweet things. Well here’s the thing. Yes, we do seem to be obsessed with sweet stuff but actually we are obsessed with food full stop/period. Now this will sound crazy, but I think we are so obsessed because we are no longer in the thralls of sugar/carb addiction. We can eat guilt free, we can now stand back and look at food in a more intellectual and creative way. We have lost that feeling, “if I don’t eat something, right here, right now I am just going to chew my arm off”. So we are more objective. Ok now I am going to stretch this a bit – feel free to laugh or comment, whatever! Now I think the reason we post more sweet stuff is because it looks better in photos (haha!). Yes and also it is more inclusive, both to Paleo and non Paleo folks. Ok maybe I should stop right now, it is starting to sound like a crazy lady excuse to bake tasty treats – even to me. So onward in my chocolate saga. I posted my Chocolate Coconut Rough slice – or should I say “our”, as the base was from Heather at Cook it up Paleo. I had a bit left over and pressed it into one of those cute tiny flan tins and it ended up looking like this. Almost too pretty to eat – yeah right, that thought didn’t last long. Preheat oven to 190 c 375 f. Lightly oil (butter or coconut oil) 11cm/41/2 in loose bottom mini flan tins. Very gently remove each flan from its tin and place on its own serving plate. Thaw frozen berries then to room temperature. Or lightly poach fresh berries by heating gently until the juices run. Divide the marscapone cream and spread evenly across each flan base. You know you can be creative with the base and fix your own fillings. How about making it a triple chocolate hit by lining the base with melted chocolate and filling with chocolate mousse. Ahhh – another chocolate recipe coming!!! wow!! that looks so good! do you know how many grams of fat are in a serving? Yes, I can say that it tastes really great and thank you for your comment and question. 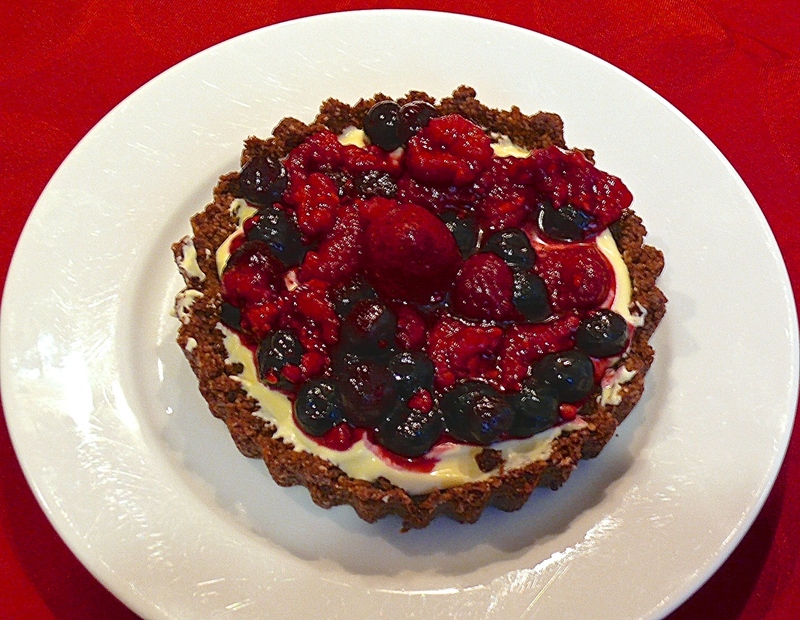 I don’t know the fat content of the tart but if you are on low fat diet it would probably be considered very high. Regardless, it is a special treat 🙂 Sorry I can’t help more.